This page was copied from Nick Strobel's Astronomy Notes. Go to his site at www.astronomynotes.com for the updated and corrected version. This material (including line art and animations) is copyrighted! See my copyright notice for fair use practices. All galaxies formed at about the same time approximately 15 billion years ago. The classical model on the origin of the galaxies says that they formed from huge gas clouds larger than the resulting galaxy. The clouds began collapsing because their internal gravity was strong enough to overcome the pressure in the cloud. If the gas cloud was slowly rotating, then the collapsing gas cloud formed most of its stars before the cloud could flatten into a disk. The result was an elliptical galaxy. If the gas cloud was rotating faster, then the collapsing gas cloud formed a disk before most of the stars were made. The result was a spiral galaxy. The rate of star formation may be the determining factor in what type of galaxy will form. But, perhaps the situation is reversed: the type of galaxy determines the rate of star formation. Which is the ``cause'' and which is the ``effect''? As of now, it is not known. A more recent variation of the classical model says that there were extremely large gas clouds that fragmented into smaller clouds. Each of the smaller clouds then formed a galaxy. This explains why galaxies are grouped in clusters and even clusters of galaxy clusters (superclusters). However, the model predicts a very long time for the collapse of the super-large clouds and fragmentation into individual galaxy clouds. There should still be galaxies forming today and that is not observed. The other model builds galaxies from the merging of smaller clumps about the size of a million solar masses (the sizes of the globular clusters). These clumps would have been able to start collapsing when the universe was still very young. Then galaxies would be drawn into clusters and clusters into superclusters by their mutual gravity. This model predicts that there should be many more small galaxies than large galaxies---that is observed to be true. The dwarf irregular galaxies may be from cloud fragments that did not get incorporated into larger galaxies. Also, the galaxy clusters and superclusters should still be in the process of forming---observations suggest this to be true, as well. Modern research into galaxy formation is also exploring the role that mergers and collisions of galaxies plays in the structure of galaxies. The distances between galaxies is large, but compared to the size of the galaxies, the distances are not extremely large. Stars inside a galaxy do not collide because the distances between them are hundreds of thousands to millions of times larger than the sizes of the stars. The distances between galaxies are only a few tens of times bigger than the galaxy sizes. Our Milky Way has several small galaxies orbiting it that are one to two Milky Way diameters away. The closest large galaxy, the Andromeda Galaxy, is only about 30 Milky Way diameters away. Galaxies in rich clusters are closer to each other than that. Collisions take place over very long timescales compared to the length of our lifetime---several tens of millions of years. In order to study the collisions, astronomers use powerful computers to simulate the gravitational interactions between galaxies. The computer can run through a simulation in several hours to a few days depending on the computer hardware and the number of interacting points. The results are checked with observations of galaxies in different stages of interaction. Note that this is the same process used to study the evolution of stars. The physics of stellar interiors are input into the computer model and the entire star's life cycle is simulated in a short time. Then the results are checked with observations of stars in different stages of their life. 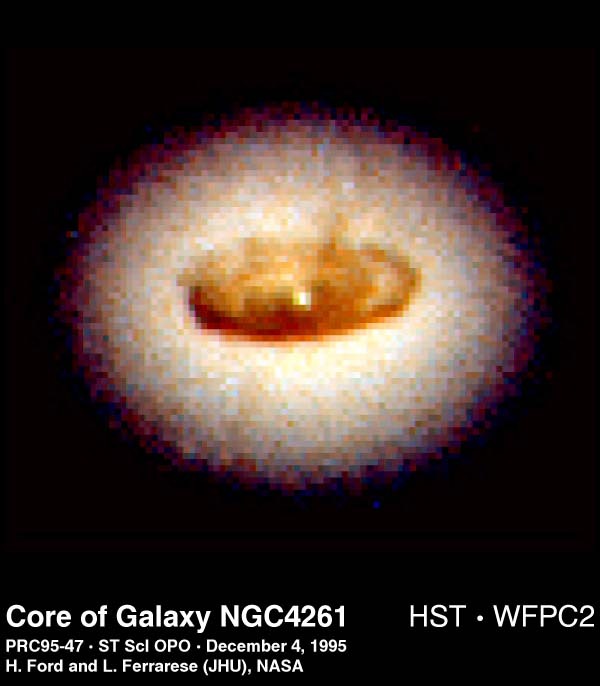 In the past, computer simulations used several million points to represent a galaxy to save on computer processing time. A simulation of several million points could take many weeks to process. However, galaxies are made of billions to trillions of stars, so each point in the simulation actually represented large clusters of stars. The simulations were said to be of ``low resolution'' because many individual stars were smeared together to make one mass point in the simulation. The resolution of a computer simulation does affect the result, but it is not known how much of the result is influenced by the resolution of the simulation and how much the ignorance of the physics played a role. Computer hardware speeds and the programming techniques have greatly improved, so astronomers are now getting to the point where they can run simulations with several billion mass points in a few weeks time. When two galaxies collide the stars will pass right on by each other without colliding. The distances between stars is so large compared to the sizes of the stars that star-star collisions are very rare when the galaxies collide. The orbits of the stars can be radically changed, though. Gravity is a long-range force and is the primary agent of the radical changes in a galaxy's structure when another galaxy comes close to it. Computer simulations show that a small galaxy passing close to a disk galaxy can trigger the formation of spiral arms in the disk galaxy. Alas! The simulations show that the arms do not last long. Part of the reason may be in the low resolution of the simulations. The stars may be flung out from the colliding galaxies to form long arcs. 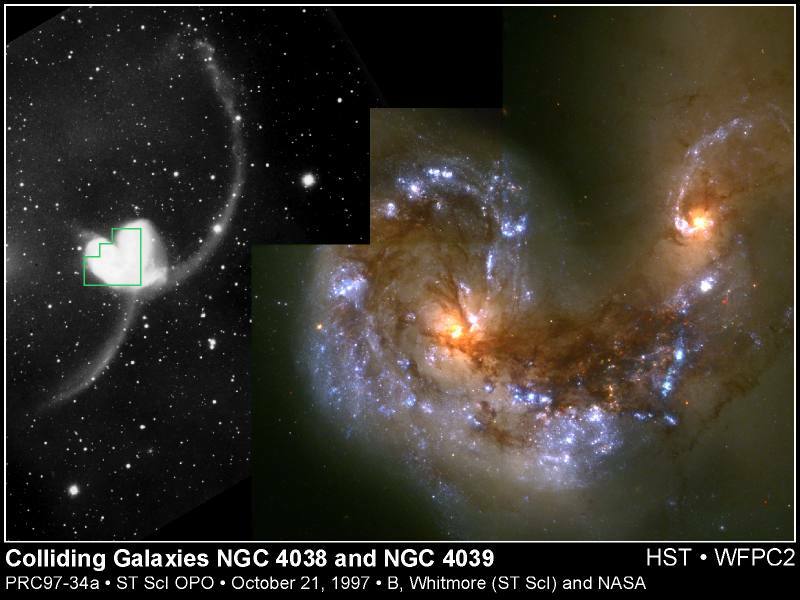 Several examples of very distorted galaxies are seen with long antenna-like arcs. In some collisions a small galaxy will collide head-on with a large galaxy and punch a hole in the large galaxy. The stars are not destroyed. The star orbits in the large galaxy are shifted to produce a ring around a compact core. Select the ``Antennae Galaxies formation movie'' link below to show a movie of a computer simulation from Joshua Barnes showing the formation of the Antennae Galaxies. It is a Quicktime movie, so you will need a Quicktime viewer. The red particles are the dark matter particles and the white and green are stars and gas, respectively. Other collision movies are available on Barnes' Galaxy Transformations web site. Here are some photographs of examples of these collisions. The first is the Antennae Galaxies (NGC 4038 & NGC 4039) as viewed from the ground (left) and from the Hubble Space Telescope (right). Note the large number of H II regions produced from the collision. 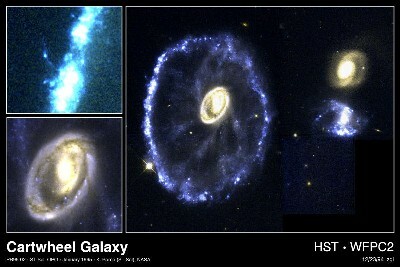 The second is the Cartwheel Galaxy as seen by the Hubble Space Telescope. A large spiral was hit face-on by one of the two galaxies to the right of the ring. The insets on the left show details of the clumpy ring structure and the core of the Cartwheel. Selecting the images will bring up a full-screen shot. The gas clouds in galaxies are much larger than the stars, so they will very likely hit the clouds in another galaxy when the galaxies collide. When the clouds hit each other, they compress and collapse to form a lot of stars in a short time. Galaxies undergoing such a burst of star formation are called starburst galaxies and they can be the among the most luminous of galaxies. Though typical galaxy collisions take place over what to us seems a long timescale, they are short compared to the lifetimes of galaxies. Some collisions are gentler and longer-lasting. In such collisions the galaxies can merge. Computer simulations show us that the big elliptical galaxies can form from the collisions of galaxies, including spiral galaxies. Elliptical galaxies formed in this way have faint shells of stars or dense clumps of stars that are probably debris left from the merging process. Mergers of galaxies to form ellipticals is probably why ellipticals are common in the central parts of rich clusters. The spirals in the outer regions of the clusters have not undergone any major interactions yet and so retain their original shape. 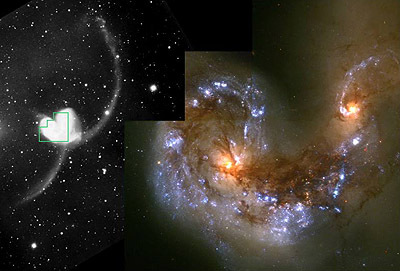 Large spirals can merge with small galaxies and retain a spiral structure. Some satellite galaxies of the Milky Way are in the process of merging with our galaxy. A recently discovered dwarf galaxy in the direction of the Milky Way's center is stretched and distorted from the tidal effects of the Milky Way's strong gravity. A narrow band of neutral hydrogen from other satellite galaxies, the Magellanic Clouds, appears to be trailing behind those galaxies as they orbit the Milky Way. The band of hydrogen gas, called the ``Magellanic Stream'', extends almost 90° across the sky away from the Magellanic Clouds and may be the result of an encounter they experienced with the Milky Way about 200 million years ago. The giant ellipticals (called ``cD galaxies'') found close to the centers of galaxies were formed from the collision and merging of galaxies. When the giant elliptical gets large enough, it can gobble up nearby galaxies whole. This is called galactic canabilism. The cD galaxies will have several bright concentrations in them instead of just one at the center. The other bright points are the cores of other galaxies that have been gobbled up. If collisions and mergers do happen, then more interactions should be seen when looking at regions of space at very great distances. When you look out to great distances, you see the universe as it was long ago because the light from those places takes such a long time to reach us over the billions of light years of intervening space. Edwin Hubble's discovery of the expansion of the universe means that the galaxies were once much closer together, so collisions should have been more common. 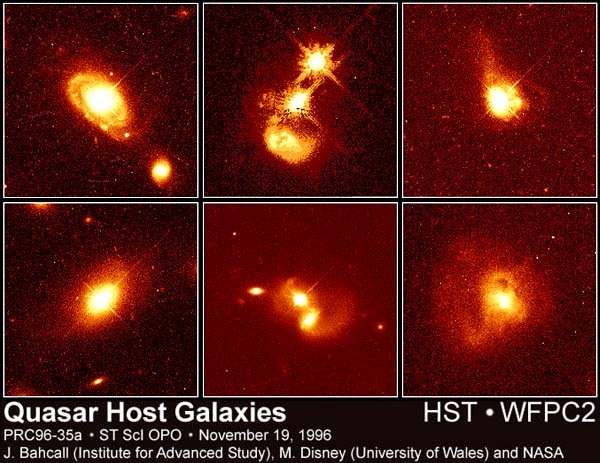 Pictures from the Hubble Space Telescope of very distant galaxies show more distorted shapes, bent spiral arms, and irregular fragments than in nearby galaxies (seen in a more recent stage of their evolution). 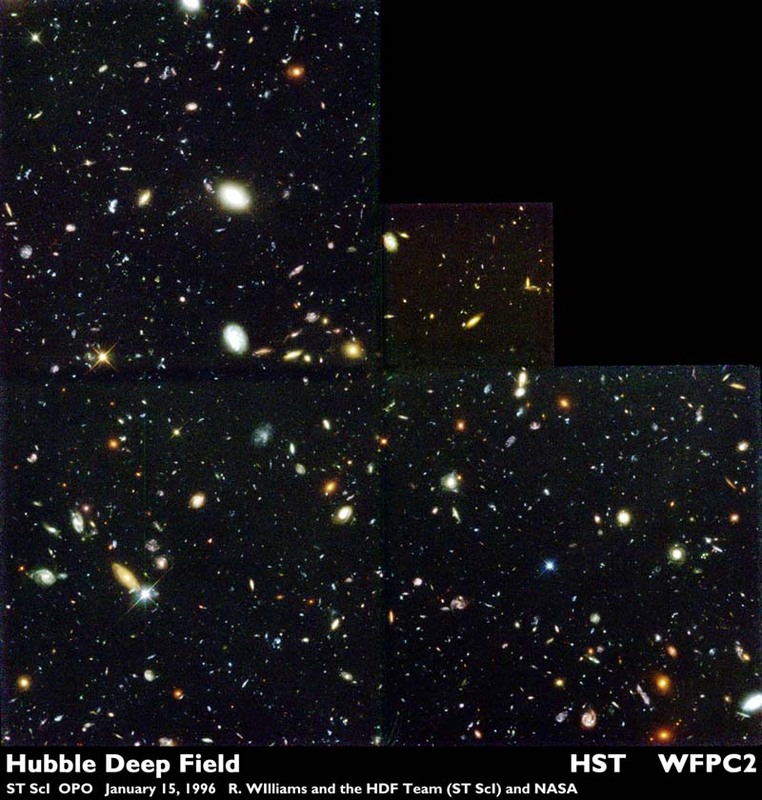 The Hubble Deep Field---a narrow look back through time past many intervening galaxies to the universe as it looked billions of years ago near the start of the expansion. There were more distorted (interacting) galaxies back then! The formation of galaxies is one major field of current research in astronomy. Astronomers are close to solving the engineering problem of computer hardware speeds and simulation techniques so that they can focus on the physical principles of galaxy formation. One major roadblock in their progress is the lack of understanding of the role that dark matter plays in the formation and interaction of galaxies. Since the dark matter's composition and how far out it extends in the galaxies and galaxy clusters is unknown, it is not known how to best incorporate it into the computer simulations. Faced with such ignorance of the nature of dark matter, astronomers try inputting different models of the dark matter into the simulations and see if the results match the observations. Some simulations suggest that a spiral galaxy without a massive dark matter halo may form a bar across the middle of it---a barred spiral galaxy is the result. There will be many new fundamental discoveries made in the coming years, so this section of the web site will surely undergo major revisions of the content. Although the content of our knowledge will be changed and expanded, the process of figuring out how things work will be the same. Theories and models will be created from the past observations and the fundamental physical laws and principles. Predictions will be made and then tested against new observations. Nature will veto our ideas or say that we are on the right track. Theories will be dropped, modified, or broadened. Having to reject a favorite theory can be frustrating but the excitement of meeting the challenge of the mystery and occasionally making a breakthrough in our understanding motivates astronomers and other scientists to keep exploring. Why must the distance to a galaxy be known first before you can measure such basic properties of the galaxy such as its luminosity, mass, and size? What are the various ways you can find distances to the galaxies? What do you find when you plot the redshifts of the galaxies vs. their distance from us? How does the speed of most galaxies vary with increasing distance from our galaxy? How does the Hubble Law show that the universe is expanding? How does the Hubble Law show that all of the galaxies are moving away from each other and that astronomers in every galaxy will see the same Hubble law? How can you measure the masses of galaxies? What is it about the motions of the stars in galaxies that indicates a large amount of dark matter is present? What is a cluster of galaxies? Are we in one? What is the nearest large cluster of galaxies to us? Why are collisions of galaxies much more common than collisions of stars? How are spiral galaxies formed? What two ways are there to create an elliptical galaxy? What kind of galaxy is typically found near the center of a large cluster of galaxies? Why is that kind of galaxy so big? Why is the spatial distribution of clusters of galaxies sometimes described as a foamy structure or like edges of soap bubbles? How do we know that the clusters have this spatial distribution? When the universe was younger, some galaxies produced a lot more radiation than galaxies do today. A typical galaxy shines with the energy from billions of stars and is tens of thousands of light years (or more) across. A peculiar group of galaxies are extremely luminous but very compact. The light from these active galaxies is produced by a strange process in the centers of the galaxies. Sometimes starburst galaxies are grouped with these peculiar galaxies, but here I will consider an ``active galaxy'' to be a galaxy with a very luminous nucleus. The great luminosity of starburst galaxies is not confined to their nucleus. The two basic things used for studying the far away galaxies are (1) the data encoded in the light received; and (2) our creative minds to interpret what is seen using the laws of physics. Some blue star-like objects appeared to violate those rules. Stars do not produce much energy in the radio band, so when strong radio emission coming from some blue stars was spotted in 1960, astronomers quickly took spectra of the stars in the visible (optical) band to find out the conditions in these strange objects. However, the pattern of lines did not match any of the lines seen in thousands of stellar spectra gathered over a hundred years. Furthermore, the spectra of the blue radio sources did not have absorption lines, but broad emission lines! What a mystery! Maarten Schmidt solved the mystery in 1963. In order to figure out the structure of the atoms producing the bizarre spectra, he set out to construct an energy level diagram from the pattern of the emission lines. He made some mistakes in his calculations because his calculations were not showing the regularity he could clearly see in the spectrum of a radio source called 3C 273 (the 273rd object in the third Cambridge catalog of radio souces). As a test of the regularity he compared the spectrum of 3C 273 with the spectrum of hydrogen. He was shocked because the pattern was the same but greatly redshifted! 3C 273 is moving at a speed of 47,400 kilometers/second (almost 16% the speed of light!). 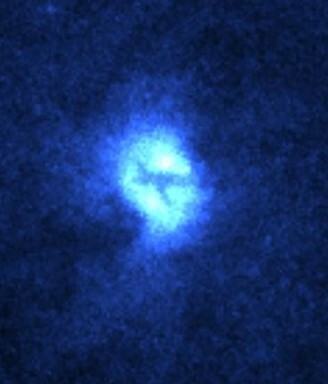 The Hubble Law says that this blue radio object is far outside the Galaxy. The other radio ``stars'' were also at great distances from us. They are called quasi-stellar radio sources or quasars for short. Later, some other blue star-light objects at large redshifts were discovered to have no radio emission, but they are also called quasars. What is strange about the quasars is not their great distance, but, rather, their incredible luminosities. They are hundreds to thousands of times more luminous than ordinary galaxies. Yet, all of this energy is being produced in a small volume of space. Their luminosity varies on time scales of a few months to as short as a few days. Remember from the discussion of pulsars and black holes in stellar evolution chapter that the light fluctuation time scale from any object gives you an estimate of the maximum possible size of the object. The maximum size = (speed of light) ×(light fluctuation time interval). The quasars that vary their light output over a few months are about the size of our solar system. This is tens of thousands of times smaller than a typical galaxy! The shape of the continuous part of a quasar spectrum is also quite unusual. Stars are luminous in primarily the visible (optical) band of the electromagnetic spectrum. The hottest stars also emit a significant fraction of their light in the ultraviolet band and the coolest stars emit a significant fraction of their light in the infrared band. Regardless of the star, though, the spectrum of a star, and, hence, the spectrum of a normal galaxy, rises to a peak at some wavelength determined by the temperature (remember Wien's law?) and drops off at wavelengths shorter or longer than the peak wavelength. Such a spectrum is called a thermal spectrum because it depends on just the temperature. Quasars have a decidedly non-thermal spectrum: they are luminous in the X-rays, ultraviolet, visible, infrared, and radio bands. They have about the same power at all of the wavelengths down to the microwave wavelengths (shortwave radio wavelengths). The spectrum looks like the synchrotron radiation from charged particles spiralling around magnetic field lines at nearly the speed of light (remember the emission from pulsars?). Perhaps the quasars are not as far away as the Hubble Law says from their redshifts. If their large redshifts are due to some powerful explosive event that shot the quasars out at some tremendous speed, then you would not have to worry about the tremendous luminosities. That would be nice, but unfortunately (or fortunately, if you like a good mystery) that does not appear to be the case. Quasars are found in clusters of galaxies. The galaxies are much fainter than the quasars so only the largest telescopes can gather enough light to create a spectrum for those far away galaxies. Their spectra also have the same large redshift of the quasars in the cluster. Also, some quasars are close enough to us that some fuzz is seen around them. The color of the fuzz is like that of normal galaxies. The spectra of the fuzzy patches around the bright quasar shows that the light from the fuzz is from stars. 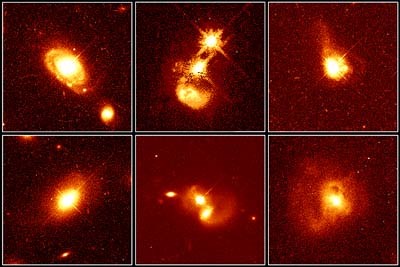 Equal opportunity quasar hosts: top left: core of normal spiral, bottom left: core of normal elliptical, top center: spiral galaxy hit face-on to make a quasar+starburst galaxy, bottom center: quasar merging with a bright galaxy and maybe another one, top right: tail of dust and gas show that the host galaxy collided with another one, bottom right: merging galaxies create a quasar in their combined nucleus. In addition, the gravitational lensing of quasars by distant galaxies is only possible if the lensed quasars are farther away than the galaxy bending the quasar's light. Quasars are the exceptionally bright nuclei of galaxies! Not all active galaxies blaze with the strength of a quasar. They do exhibit a non-thermal spectrum that has no peak and does not depend on the temperature. Also, their energy is generated in the nuclei of galaxies. The active galaxies are less energetic cousins of the quasars. Their luminosity is between the luminosities of typical galaxies and the powerful quasars. 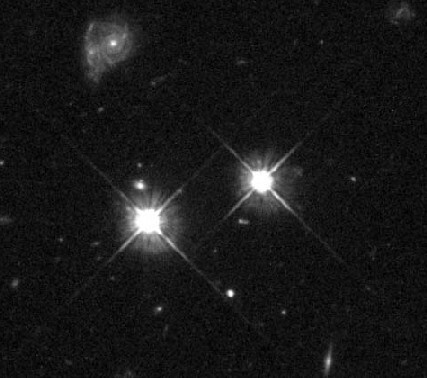 Whatever is going on in quasars is going on in active galaxies to a lesser extent. One type of active galaxy is the Seyfert galaxy, named after Carl Seyfert who was the first to discover the peculiar spectra of these types of galaxies. A Seyfert galaxy is a spiral galaxy with a compact, very bright nucleus that produces a non-thermal continuous spectrum with broad (fat) emission lines on top. Some of the emission lines are produced by atoms that have several electrons removed from them. Such highly ionized atoms are found only in regions of intense energy. Many Seyfert nuclei are in disks with distorted spiral arms and a companion galaxy nearby that is probably gravitationally interacting with the galaxy. The Seyfert galaxy NGC 1566. The energy of Seyfert galaxy nuclei fluctuates quickly like the quasar fluctuations, so the energy generator must be quite small. The broad emission lines are produced by gas clouds moving at about 10,000 kilometers/second. The doppler shifts of the gas moving around the core widens the emission lines. Some Seyfert galaxies have narrow emission lines instead of broad emission lines and are bright at infrared wavelengths. These are called ``Type 2'' Seyferts to distinguish them from the classical ``Type 1'' Seyferts with the broad emission lines. 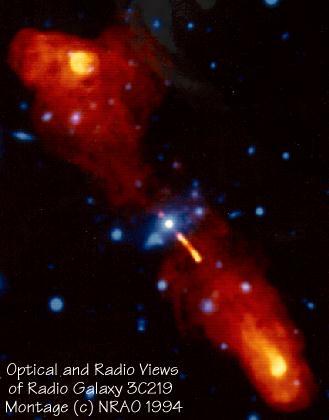 Another type of active galaxy is the radio galaxy, which emits huge amounts of radio energy. The radio emission comes from the core AND from very large regions on either side of the optical part of the galaxy called ``radio lobes''. The radio lobes can extend for millions of light years from the center of the galaxy. The radio emission from normal galaxies is thousands to millions of times less intense and is from the gas between the stars. 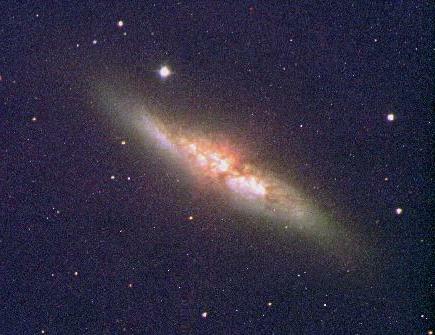 Most radio galaxies are elliptical galaxies. The spectrum of the radio emission has the same non-thermal (synchrotron) shape as the quasars and Seyferts. The radio lobes are produced from electrons shot out from the nucleus in narrow beams called jets. When the electrons in the beam hit the gas surrounding the galaxy, the beam spreads out to form the lobes. quasars can have huge radio lobes too. Some lobes are swept out into arcs behind the galaxy. This is probably caused by the galaxy moving through the gas around the galaxy. A third type of active galaxy called BL Lacertae objects (BL Lac objects for short) are probably radio galaxies with their jets pointed right at us. The energy from BL Lac objects varies very quickly and erratically. So here's the problem: how does nature produce such objects that are luminous over a large range of wavelengths and generate the energy in a very small volume? The number of stars needed to produce the tremendous luminosity could not be packed into the small region and neither would they produce the peculiar non-thermal radiation. One mechanism you have already learned about is the intense radiation produced by hot gas in an accretion disk around a black hole. In order to produce the enormous amount of energy seen in active galaxies and quasars, the black hole must be supermassive. The intense radiation from the disk would drive the gas outward if the black hole did not have enough gravity to keep the gas falling onto the black hole. The derived masses needed to produce the gravity strong enough to overcome the radiation pressure outward are 100 million solar masses to billions of solar masses. The accretion disk is a few trillion kilometers across (a few light months across) but most of the intense radiation is produced within a couple of hundred billion kilometers from the black hole. The gas in the disk is heated by the friction it experiences rubbing against other gas in the disk and also by the release of gravitational potential energy as it falls inward onto the black hole. If you have dropped down from a large height (from a tree or ladder?) you know that your feet absorb a lot more energy than if you dropped from a small height (you did land on your feet, hopefully). The gravitational potential energy you had above the ground was converted to kinetic energy (energy of motion) as you fell. If you dropped to the ground from a very high height (great gravitational potential energy), you know that you would hit the ground with a great amount of energy. The situation would be worse on an object with stronger gravity. The process of converting mass to energy from falling onto a black hole has an efficiency that is over ten times as large as the efficiency of nuclear fusion. The amount of mass needed to power the nuclei in active galaxies is from one to ten solar masses per year. If there is a strong magnetic field in the accretion disk, the magnetic field lines can be distorted into a tangled, narrow mess of magnetic field lines that run toward the poles perpendicular to the accretion disk. Gas escaping along the magnetic field would produce the beams of electrons and gas seen in the jets to make the radio lobes of radio galaxies. 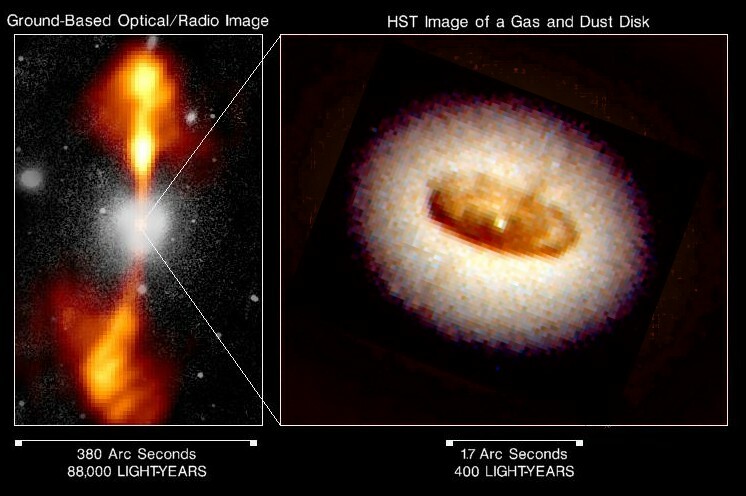 Also, the shape of the accretion disk may play a role in directing the gas into the jets. The outer parts of the disk can be thick, but they will narrow down to a very thin layer just outside of the black hole. A thick accretion disk that narrows down only very close to the black hole could pinch the outflowing gas into a narrow beam. Around the accretion disk are relatively dense clouds of hot gas that could be responsible for the broad emission lines seen in Type 1 Seyferts. Further out is a thick dusty molecular doughnut-shaped ring with a diameter of 10 to several hundred light years. The particular type of active galaxy seen then simply depends on the angle the accretion disk and dust ring are to the line of sight. If the accretion disk is tipped enough, the fast-moving hot clouds that produce the broad emission lines of Type 1 Seyferts are visible. If the dust ring hides the accretion disk, then only the slower-moving hot clouds that are farther from the black hole are visible. The results is the narrow emission lines and the dust ring glowing in the infrared of a Type 2 Seyfert. If the disk is face-on and a beam of radiation is being produced, then the active galaxy is a BL Lac object. The Hubble Space Telescope has imaged the nuclei of several active galaxies. Around the core of the radio galaxy NGC 4261 is a ring of dust and gas about 400 light years in diameter and the jets emerge perpendicular to the plane of the dust/gas ring. The black event horizon of the supermassive black hole is too small to be resolved from our distance. Select the image to get an enlargement of the HST image. 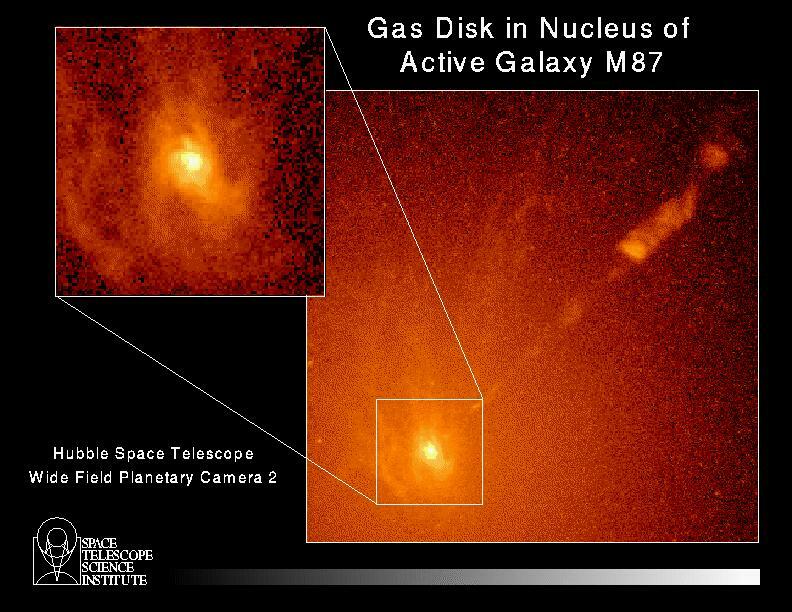 The core of the active galaxy M87 is seen to have a disk of hot gas moving very quickly around the center. Doppler shifts of the disk material close to the center show that the gas is moving at speeds of hundreds of kilometers per second. Blueshifted lines are produced from one part of the disk and redshifted lines are produced from the opposite part of the disk. This is clear proof that the disk is rotating. The speed and distance the gas is from the center show that the central object must have a mass of 2.5 billion solar masses. Only a black hole could be this massive and compact. The jet coming from the nucleus (visible in the wider-field view at right) is also seen to be perpendicular to the plane of the disk. Galaxy nuclei do not remain active for billions of years. Eventually, the gas fuel runs out in the accretion disk. The disk's gas can be replenished if some stars in the galaxy wander too close to the central black hole and get stretched apart by the black hole's strong gravity. Select the link below to show a spiral galaxy turning into a quasar when some material is dumped onto the supermassive black hole at the center. It is a mpeg movie, so you will need to have a mpeg viewer. Also, galaxy mergers and collisions will keep the gas and stars in the central part of active galaxies sufficiently stirred up so some of that material will become part of the accretion disk. The expansion of the universe decreases the rate at which interactions will happen. Because the frequency of galaxy close encounters decreases over time as the universe expands, the quasars and active galaxies can last for only a few billion years at most. Quasars tend to be found at great distances from us; there are no nearby quasars. When we look at quasars, we see them as they were billions of years ago. The number of them increases at greater distances, so that must mean they were more common long ago. The number of quasars peaks at a time when the universe was about 20% of its current age. Back then the galaxies were closer together and collisions were more common than today. Also, the galaxies had more gas that had not been incorporated into stars yet. The number of quasars was hundreds of times greater than the time closer to the present. At very great distances the number of quasars drops off. The light from the most distant quasars are from a time in the universe before most of the galaxies had formed, so fewer quasars could be created. This model predicts that there should be many dead quasars lurking at the cores of galaxies. Astronomers are beginning to find the inactive supermassive black holes in some galaxies. In most galaxies the central black hole would have been smaller than the billions of solar mass black holes for quasars. This is why the less energetic active galaxies are more common than quasars. Our galaxy harbors a supermassive black hole in its core that has a mass of ``only'' 2.5 million solar masses. Astronomers are studying the cores of other normal galaxies to see if there are any signs of supermassive black holes that are now ``dead''. X marks the spot in the core of the Whirlpool Galaxy! The darkest bar may be the dust ring seen edge-on. The jet seen in wider fields of view is perpendicular to the darkest dust ring. The lighter bar may be another disk seen obliquely. A million solar mass black hole is thought lurk at the center. An important implication of the fact that there were more quasars billions of years ago than there are now, is that the universe changes over time. The conditions long ago were more conducive to quasar activity than they are today. In the next chapter you will explore the overall evolution of the universe. You will need to remember this point about a changing universe when you consider ideas for how the universe formed and grew. Also, the sharp drop in the quasar number for the earliest times is evidence for a beginning to the universe. Compare the luminosity and size of the power source for quasars to that of a normal galaxy. Contrast the shape of the spectrum and the relative power at different wavelength bands (X-ray, ultraviolet, visible, infrared, radio) for the energy coming from quasars (and active galaxies) to that from mormal galaxies (and stars). What produces the huge power output in quasars and active galaxies? What could cause the power generation to ``turn off'' and later turn back on? What determines the type of active galaxy (i.e., Seyfert 1 or 2, radio galaxy, BL Lac, etc.) you will see? What is the broad-line emission region and what must the orientation of the disk and dust ring be to see the broad-line emission region? What are the jets in active galaxies and how are they produced? Why are there many more quasars billions of light years away than nearby? Include in your explanation a contrast of the conditions of the universe billions of years ago to the current conditions. What does the changing number of quasars with increasing distances tell us about the character of the universe?